ChillerExchange.com offers used industrial chillers, air cooled chillers, water cooled chillers, glycol cooled chillers. 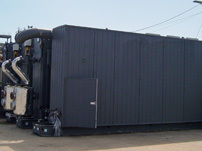 Listings for used and surplus Centrifugal Chillers, Rotary Screw Chillers, Cooling Towers, and Compressors. Sellers can list chillers for buyers to purchase worldwide whether used surplus or reconditioned.